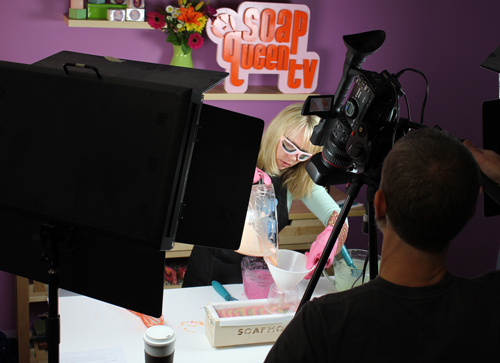 We had a very entertaining Soap Queen TV shoot today. And, I’m betting you can guess what the first project was! That’s right, we’re doing an Advanced Cold Process project. Woot woot! 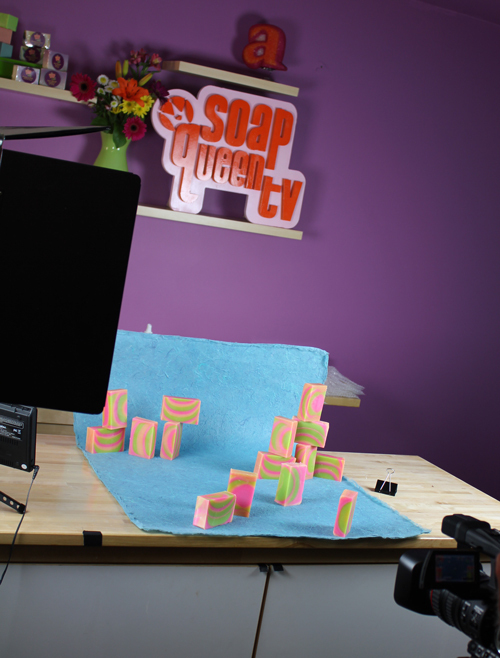 We decided it was time to follow up the popular 4-episode Starting Cold Process Soapmaking series with a bold, bright, colorful trifecta of joyousnesss. 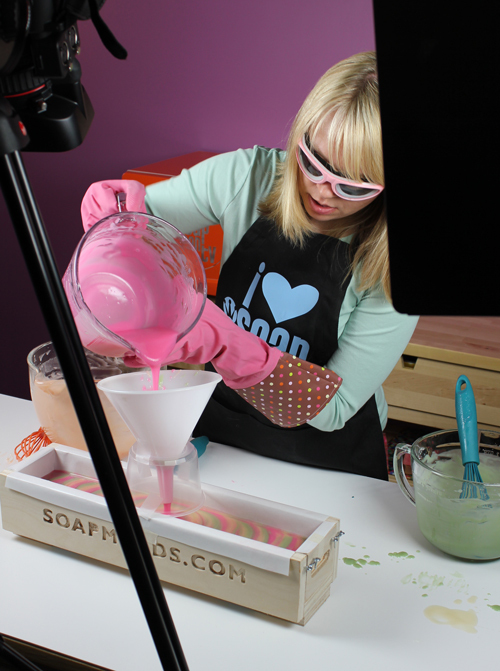 I busted out a new set of pink gloves to go with the newly designed bright set and the cheery soap colors (Tangerine Wow! and Electric Bubblegum Pink plus a specially designed green blend just for this project). 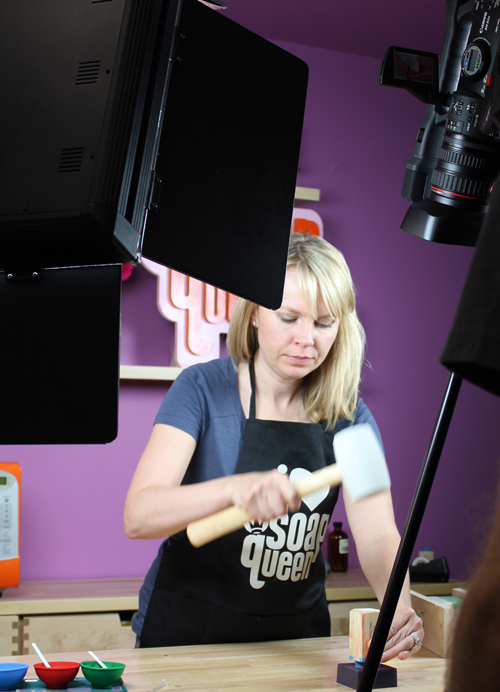 I look super serious in this photo but really, I’m just concentrating on hitting that mallet in just the right place to make a perfectly impacted stamp in fresh melt and pour. We’ve got some fun tricks up our sleeves to make the clear Acrylic Stamps and the Resin stamps come out lookin’ fine and fly every single time. And here are the dimensions from the site: 2 3/4″ x 3 1/2″ x 17 1/2″ and holds about 5 pounds of soap. I want to buy this mold with my next order but the website doesn’t specify the order of the dimensions. From the pic it seems to be wider than it is deep. Is that right? Sorry for my obtuseness…is the 4-episode Starting Cold Process Soapmaking series something on your YouTube channel or on the DVD that BB sells? I have the DVD, but haven’t watched it yet. :} Thanks! The series is free on our Soap Queen TV channel. Here’s an easy link to all 4 episodes. Thank you so much for taking to time to show all these wonderful techniques!! Thanks Tammy. We have a good time making them. Can’t wait for new idea’s! I already learned a new way to hold my funnel from these pictures!!!! We experimented with so many different ways to make a funnel stand. You can see what we decided on and it works great! I’m looking forward to your new videos! They’re always so fun! On TV they call these teasers 🙂 Can’t wait to see them and I will start saving money now so I can buy supplies as I know I will want to try them all!